What is the Quadrilateral Theorem? Before we discuss the Quadrilateral Theorem, let us discuss what is Quadrilateral in Mathematics. A quadrilateral is a polygon with four vertices, four enclosed sides, and 4 angles. The sum of the interior angles of each polygon is 360-degrees and the sum of exterior angles should be 180-degrees. The length and angles could be different and named as per the dimensions like a parallelogram, rectangle, squares etc. Each of the polygons has different properties based on the sides and its angles. Now let us have a quick look at angle sum property or Quadrilateral theorem now. 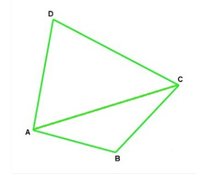 In the figure given above, ABCD is the quadrilateral and ABC, BCD, and CDA, DBA are the internal angles, AC is the diagonal that divides the quadrilateral into two triangles further. These are the triangle ABC and triangle ADC. As we know that sum of interior angle should be 360-degrees, so, based on the quadrilateral theorem, the sum of ABC + BCD + CDA + DBA would be 360-degrees. One property is already given in the definition that opposite sides would be equal and parallel. If you will draw a line out then you can notice that it will never meet. So, how could they meet and how to draw the line out in this case. Another property is that opposite sides are equal to each other in length as well. If you will take a ruler and measure the length for each pair then you could quickly judge the statement. So why don’t you try it yourself? The next property is not given in the definition but defined in the form of diagonals. For the two parallel opposite sides, the diagonals will bisect each other exactly at the midpoint where they meet each other. The last property is related to the angle where opposite angles are measured equal. The two angles make a pair would be equal when moving around the shape clockwise. Also, the adjacent angles of a polygon would add up 180-degrees that are also named as the supplement angles. Here, you could combine any two angles bottom two, top two, left two or right two etc. Now you understood the basic Quadrilateral Theorem, what is quadrilateral and its properties too. With the help of quadrilateral Theorem formula, you could solve typical problems in the real life. A quadrilateral may be Trapezium as well or it could be a Rhombus. Here, the side and angle properties would be different and they are dedicated to special theorems too.